NewMarket Health is a publishing and supplement company located in Baltimore, MD. For almost two decades, we've been cutting through the red tape — reporting on proven, natural cures and turning breakthrough ideas into cutting-edge health solutions. Whether reporting on a new cure from the Amazon or discovering a new ingredient that will help our customers get better results, we believe in producing quality editorial and developing products that will have a profound effect on our customers’ lives. To learn more about our brands and product mix, check out our Natural Health Products and Publications page. What’s New at NewMarket Health? A few times throughout the year we offer optional volunteer outings. Whether it’s sorting donated toys for the Salvation Army’s annual Elf Night or serving meals at My Sister’s place, we believe it’s important to give back to our community. We believe spending time outside of the office only helps improve our bond. We attend Oriole’s games, take group outings, get together for happy hours, and have a monthly team breakfast. When we’re not hitting home runs through our marketing efforts, you can find members of our team swinging for the fences in a local social league. We’ve played together as a softball team for years and actually like spending time together off the clock. Birthdays, weddings, babies... We know that life is filled with many happy occasions and we like to celebrate milestones in each other’s lives. You’ll often find a desk decorated with balloons and birthday memes or an invitation in your inbox for a baby shower or two. We believe that our best ideas come from people who are encouraged, respected, and trusted. It's part of our job to help you grow here at NewMarket. We'll make sure you are given the tools needed to be the best employee (and person) you can be. Whether you've worked with the company for 20 years, or just 2 months... we want to hear what you think. 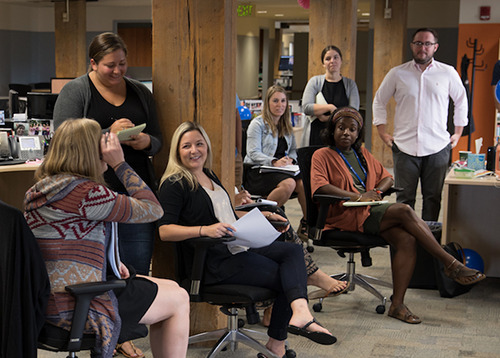 We meet monthly as a team to talk about how we're growing as a business and to brainstorm our next big initiatives. We believe in becoming a better version of who we were yesterday. We believe in testing and constantly trying to outdo ourselves. We know that we must keep learning to grow. If we’re giving you room to test brilliant ideas... they won’t all work, but it’s important for you to keep trying. We believe it’s okay to fail, but fail quickly and learn from it. In fact, we think those things stifle creativity. Our workplace is casual, relaxed, and designed to promote innovation.